They’re easy and simple to use. You don’t want to always rely on your phone when you meet someone. Think of how easy it is to swap cards. Now think of the multiple steps it takes to do something on your phone. Or how hard it is to do anything on your phone if there’s no service or battery life. They’re the best networking sidekick. Think of business cards like your golden ticket to professional events. They’re the currency of networking and are often required to participate in some conference events/giveaways. They let your personality shine. Have you spent time curating a personal brand? Perfect, business cards are a great way to extend your brand with a carefully selected look and feel. They give you legit vibes. Older professionals are going to be impressed when they realize you have your own business cards, trust us on this. It’ll help you seem like you know the rules of the business world. 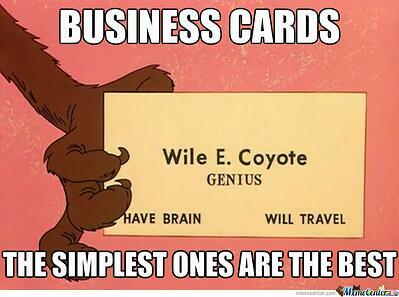 What goes on a good business card? Highlight the essentials. Your card should stick to the essentials with your name, email, and phone number. If you’re in school, your school email is fine. If you’ve graduated, try creating a new, professional Gmail account so you start to differentiate yourself from being a student. Also include a line about who you are such as “Virginia Tech Class of 2019” or “Marketing Professional” so people instantly know more about who you are. Also, feel free to include your website if you have your own portfolio site for work. Beware social media: Only include your social media if it’s important to your professional life. Maybe you’re a designer who uses Instagram for work, a political science student who uses Twitter to discuss policy, or an avid LinkedIn user. Those are all great reasons to include social media. Stay away from including it if it only features your social life, instead of your professional life. Design it well: You don’t have to be a graphic designer to have an awesome card. In fact, the websites recommended below have a bunch of templates to choose from and allow you to personalize your card. Just make sure you stay aware of common design pitfalls such as small text, hard-to-read colors, and overly busy designs. The time has officially come for you to order your own business card! Try one of the sites below to get going. Start with a small order to make sure you like them and then start putting those business cards to use!